Bengaluru: “Today, 593 students have graduated: 20 students from the Fellow Programme in Management, 22 from the Post Graduate Programme in Public Policy and Management, 71 from the Post Graduate Programme in Enterprise Management, 1 from its earlier avatar called the Post Graduate Programme in Software Enterprise Management, 73 from the Executive Post Graduate Programme in Management, and 406 from the Post Graduate Programme in Management,” announced Professor G. Raghuram, Director, IIM Bangalore, at the institute’s grand 43rd Annual Convocation ceremony, held on March 17, 2018. 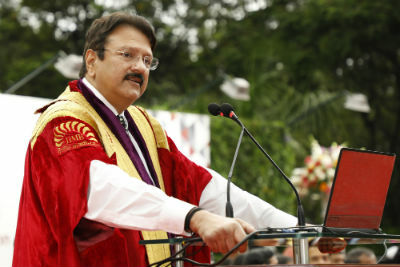 The students graduated from the prestigious institution this year in the presence of chief guest Shri Ajay Piramal, Chairman, Piramal Group and Shriram Group, Professor G. Raghuram, Director, IIMB, Board members including Shri N S Raghavan, and members of the faculty. The graduates were cheered by their proud families too, many of whom had made the trip to Bengaluru to capture the joyous moment forever. While listing student achievements, Prof. Raghuram made special mention of the Fellow Programme and Post Graduate Programme in Enterprise Management. “This is the third year in succession – a hat-trick—that we have 20 students graduating from the Fellow Programme. This year is also very special for our Fellow Programme as the 250th student just graduated. I would also like to mention that our Post Graduate Programme in Enterprise Management celebrates 20 years and has just graduated 1500 executives”. Among the graduating students this year, eight have been awarded gold medals. Out of the eight gold medallists this year, two are women. In PGP (Batch 2016-18), Pratik Anand, Umang Mehta and V Vageesh received the gold medals for first rank, second rank and best all round performance, respectively. In PGPPM (Batch 2017-18), Richa Valechha has won the gold medal for best academic performance. From PGPEM (Batch 2016-18), the gold medal for first rank and for best all round performance went to Gaurav Kumar and Sunil Kumar Vaya, respectively. In EPGP (2017-18), Pragya Dalmia has won the gold medal for first rank, while Jigar Doshi has won it for best all round performance. He said that for any individual to be successful, a few life lessons are vital. “First, there should be a deep driving desire, followed by action and deed, which in turn will make and fashion your destiny. If you are passionate about something, you will develop the will and ability to do it. That has been the kernel of thought in our group too”. He said that the second lesson he learnt and wants to share is that we need to have the courage to go on the path less travelled if we were to make exceptional growth in our careers. “You need to take the risk, even suffer pain at the initial stages. But in the long run you will be the beneficiary”. He cited the examples of Bill Gates and Jamshedji Tata, who he said acquired exceptional success by following that path. “When our group made an entry into lending to real estate that was also a value creating decision”. “The third lesson is that your judgement has to be value based in business, and that will create economic value in the long run. Even in short term, appreciate that values will create economic value in your career”. He went on to say: “Another vital element for success is that you need to have association with good people and mentors to overcome the slippery slopes of life”. “Next, you need to prioritize your life – first your health, then your family, and then your business or profession”. “Last but not the least, do have a sense of gratitude at all the privileges that you are getting. Therefore, have an obligation to give back to society”. Despite a smattering of rain on this March evening while the Convocation ceremony was in progress, the graduating students were not deterred, and they egged everyone on to have the ceremony continue at the Open Air Theatre, despite alternative arrangements being in place. And continue it did at the OAT, amidst much cheering and bonhomie.